He increased his Zone% a bit from 2013 t0 2014 (41.9% to 43.6%) and saw his K% increase (12.2% to 14.1%) and BB% drop (8.4% to 7.5%). While, it may seem intuitive that throwing strikes leads to better strikeout and walk rates, I have never seen it tested. I will remedy this issue right now. The key to take from this chart is the how Zone% has no effect on strikeouts, but correlates almost exactly with BB% (r-squared = .95) with a 0.4% drop in BB% for every 1% increase in Zone%. Looking back at Gibson, he had a 1.7% point increase in Zone% so his BB% would drop 0.7% points (actual was 0.9% points). 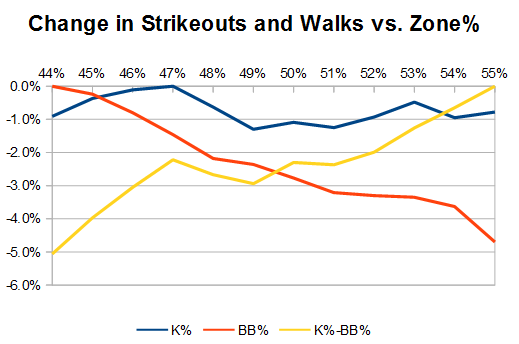 The change in strikeouts probably had little to do with the increase in Zone%. One possibility of attacking the strike zone more is an increase in hard hit balls. 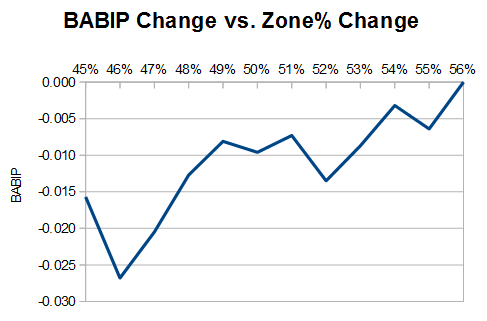 Here is the BABIP curve as pitchers see their Zone% increase or decrease. I looked at home run data and it was all over the place with no correlation. The BABIP curve is a little more interesting. For every 1% increase in Zone% a player’s BABIP will go up 1.7 points. So the pitcher is giving up more hits, but less walks. Finally, here is a curve with for Zone% vs WHIP to see which one of walks rate or BABIP overrides the other. 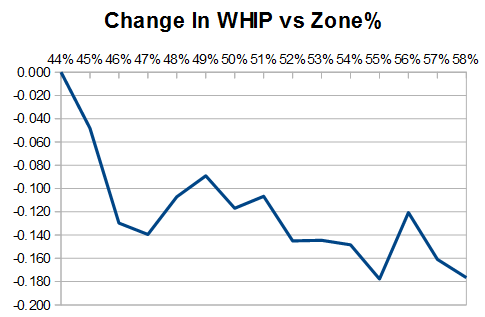 The extra hits offset some of the gains from the walks, but as Zone% improves a pitchers WHIP should go down. Going back to our original example of Kyle Gibson, he saw his WHIP plummet from 1.75 to 1.31. As pitchers attack the strikezone more and more, their walk rate will decline, but the number of hits they give up will increase. The amount of walks offsets the hit increase as seen by a drop in WHIP. In the overall scheme of things, a higher Zone% is better. We hoped you liked reading How Changes in Pitcher Zone% Affect Other Rates by Jeff Zimmerman! While you still have the data open, is there any correlation to ISO with zone%?